In our Preview, some of the key areas to watch for were Pitt's Offensive Efficiency and their Offensive Rebounding Percentage. Looking at the Four Factors, we can see how good of a performance it was by Marquette. Marquette won every single area of the Four Factors. 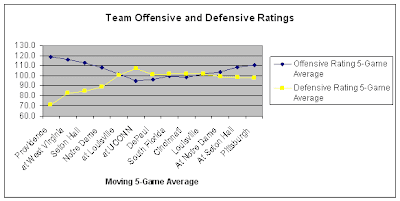 Pittsburgh was the #8 team in the country at offensive rebounding percentage, and we managed to win the battle of Offensive Rebounding and to hold them well below their average. Don't look now, but Marquette has triumphed in this area in four of the last five contests. In addition, Pitt was the #14 team in the country at Offensive Efficiency with a rating of 115.7. For Marquette to hold them to an efficiency of 83.5 shows how well MU did at defense. The Offensive and Defensive Ratings for our team continue to move in the right directions. As one can see, there was a terrible trend for both areas, which reached a nadir at the UConn game. The team plateaued until the Cincinnati game, and now things are moving properly. Right now, the team is getting better at the end of the season, which is a refreshing change. In addition, despite all of our troubles, we are still rated as the #15 Offense and the #12 Defense in the country by Pomeroy. That's pretty darn good, folks. Pomeroy still projects a final conference record of 12-6, meaning one loss in our last five conference games. Based on how we've been playing the last five games, we project to a final record of 13-5, meaning we run the table. Last time we did the projections, the view was for the team to lose anywhere from 0-3 games. Based on how the team continues to improve, our current forecast is consistently only 0-1 more losses. Fresh off of a week in which Cracked Sidewalks said that Jerel McNeal was not a winning player during conference play, McNeal ended up as the statistical stud of the game. Barro, of course, was second on the list, with other noteworthy contributions by Cubillan, Matthews, and James. Interestingly enough, Lazar Hayward ended up with a negative net contribution, as Sam Young seemed to win the head-to-head battle and the perceived lead for "Most Improved Conference Player". Finally, although I was reasonably sure that Mbakwe ended up with 38 points, 19 rebounds, and 8 blocked shots in his eight minutes of play, the box score didn't seem to reflect that information. Poor Trevor starts off his college career with a negative net game. May this be his last! All the numbers are starting to point in the right direction. Let's hope that the momentum continues and we win big against St. Johns on Wednesday.